At the age of 16 he went to study at ‘Bournemouth College for Catering’ and qualified with honours. He subsequently spent several years working as a chef in central London, within a range of venues and with a wide variety of clientele i.e. Café Rouge, Hyde Park, Kensington Palace where he worked with top cookery guru Prue Leith; as well as catering for events hosted by President Bush (senior) to name a few. After gaining such a diverse array of knowledge and experience, he returned to his birth place Liverpool with not just his passion for food heightened but also his business acumen. He began working in central Liverpool at restaurants like ‘Ego’ on Hope Street and ‘Warrens Bistro’ on Mount Pleasant Street and was featured in the Watson’s & Phillips food magazine. In 1999 his award-winning jerk chicken was chosen as the best in Merseyside and he then went on to take part in ‘Too many cooks’ Live Challenge. He founded his own company ‘Just Spice’ in 2007, based in the north of England whose client base is widely spread across the northwest, Liverpool, Manchester and Chester. The company provides “catering services that range from dinner in your own home, wedding & family occasions to corporate lunches; providing catering & consultation for major events and festivals” and also introduces a range of branded products. Taking an active role in all the elements of his business from managing staff, budgeting, ordering stock, keeping accounts, to promoting the menus; he seems to find it easy applying all the skills he has acquired over his rich 25 years in the industry. Its clear he sees every element of cooking as important even down to the nutritional content and with a growing interest in healthy eating, began the creation of low GI food menus, special menus for diabetics and heart patients, and various dishes for those with a range of dietary requirements. 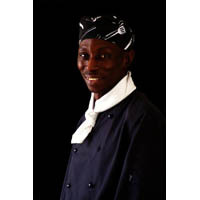 The blend of culture and food has he says “always been large part of my growing up; I would cater for African events from an early age and that is where my inspiration comes from.” In his spare time Andrew can be found on his blog, answering questions on Afro/Caribbean cooking, advising and inspiring chefs and foodies from all walks of life. Most recently he worked at the Redhouse Farm event at Altrincham, offering an array of cultural tasters & promoting the new ‘Chef Essential dry blend’ brand from his stall.